Light Up the World is our motto here at Gallo Guitars. There’s this duality between light and darkness, but I look at it as darkness being defined as “the absence of light”. To me, Gallo Guitars is a beacon of light to creativity, expression and truth. I want light to be shone over artists who, just as me, believe that they can make a difference. We are Gallo Guitars. A NYC-based art studio that strides to enhance the musical experience for musicians and their fans. Our Gallo Guitars line enables artists to interactively share their ideas and emotions. All of our guitars are hand-built at our Gallo Guitars Studio in Boston, MA. They are all one-of-a- kind art pieces and are individually hand-crafted for optimal performance. 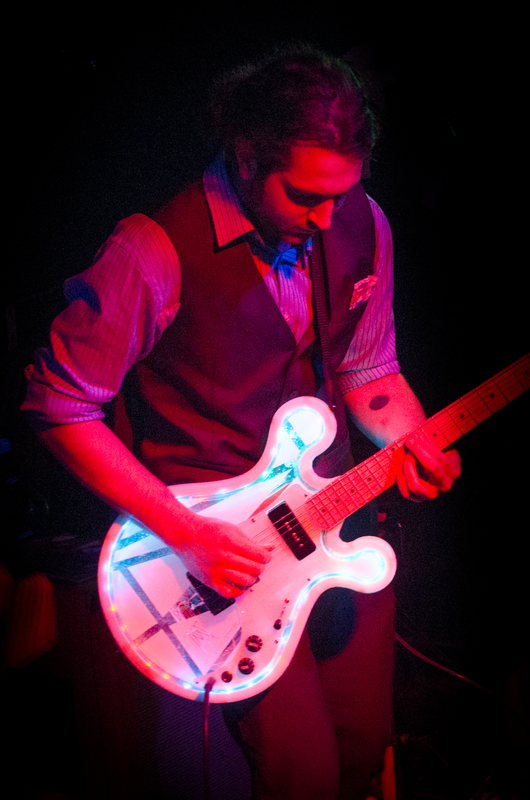 All of our Gallo Guitars include a sound-reaction system that powers embedded LED lights and makes them respond to the sound of the instrument. The limited-edition Gallo Guitars are marked with the date and the corresponding edition number. They are available for purchase at the Gallo Guitars online store. For sound-reaction and tonal demonstrations make sure to click on the demos tab. Gallo Guitars started as a special project of our own Jose Gallo in January 2014. Jose founded Gallo Guitars as a student at The Savannah College of Art and Design while preparing to obtain his bachelors degrees in sculpture and photography. His goal was to use his artistic abilities to explore the musical boundaries of contemporary technologies, such as computer modeling, rapid prototyping and microcontrollers. As his project evolved, Jose collaborated side-by-side with students from Georgia Tech (MIchael Sobrepera) and The Berklee College of Music (Jay Pee Chroma) to consolidate his exploration. Through these relationships, Jose was able to generate top-of-the-line guitars that use the best from the technological and musical worlds. After completing his higher education, Jose devoted himself to completely developing his line of interactive instruments, as well as to perfecting his craft. He continued to work with performing and professional musicians, as their input was vital to the development of an exceptional instrument. The development of the first edition of Gallo Guitars started on November 2014 and launched a year later to inaugurate the gallo.guitars website and e-store on November 2015. For 2016 Jose relocated to Boston to grow his guitar project and opened the official Gallo Guitars art studio. With this came several initiatives such as the What's New blog, where Gallo Guitars features studio logs, performing artists and art related articles. We have also featured a one-on-one interview with Jose on Gallo Guitars, which you can find right here. Currently, Jose runs his Gallo Guitars studio in NYC. Gallo Guitars' 3 new models are now available in our online store.